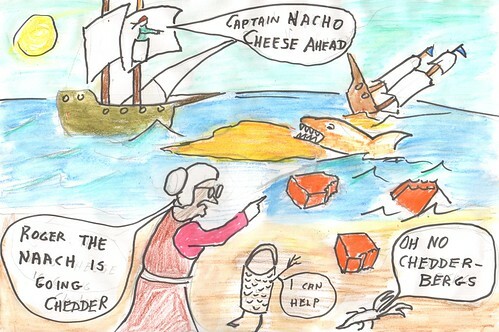 The only problem was that her enemy, Cheddar Cheese Shark, was trying to turn the Pacific Ocean into Cheddar cheese! Suddenly, a mysterious stranger appeared on a hologram screen in the museum who said that he would give them directions to a great cheese grater. “That’s perfect, this grater could stop my cousin from turning the Pacific Ocean into Cheddar cheese!” Rodger shouted loudly. “But this could be a trap” whispered Mrs. McCrankey to herself. 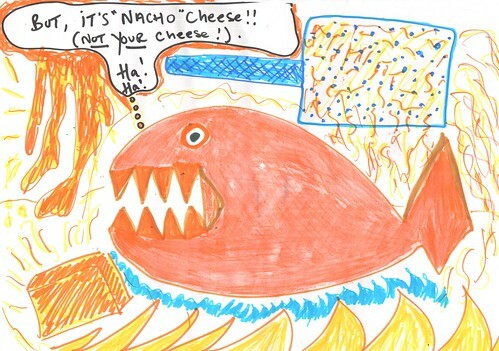 Meanwhile, Cheddar Cheese shark was watching “Channel Cheese” on his TV when he saw the mysterious stranger pop up on his screen too. He jumped out of his seat and it fell backwards onto the floor.